Canoes and Kayaks racing over short distances on flat water are collectively referred to as Canoe Sprint by the international Canoe Federation. Canoe Sprint or Sprint Racing (as we are more inclined to refer to it) is an Olympic Sport with World Championships held every year along with European Championships and World Cup Events. The sport is very active in Europe, Australasia, Canada and South Africa. The USA has a lower profile than might be expected based on its size and general sporting prowess and other nations do compete e.g. Argentina, China etc. 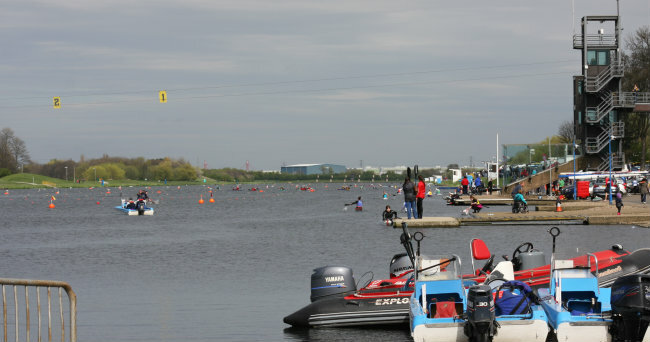 Racing takes place in Kayaks and Canoes and crew boats e.g. 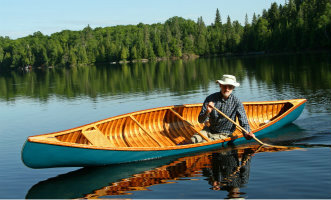 K2, C2, K4 are popular ( K or C stands for Kayak or Canoe and the number indicates how many paddlers are in the boat). Paracanoe is a growing area of competition with its inclusion in the Olympics raising its profile. The primary distances over which paddlers race are 200m, 500m, 1000m and 5000m. With the exception of 5000m all the distances race in a straight line from a standing start in head to head racing. Depending on the number of competitors there will usually be heats, semi-finals and finals. 5000m is usually run over a course with straight sides and wide turns with a mass start and no heats. This is the only race where paddlers do not have to stay in lane and where wash hanging is allowed. At Olympic level only a few of these classes get to race and there have been a number of changes over the past decade in the Olympic distances raced. Recent announcements that Men’s K2 200m would be dropped from the Olympic program to make way for Women’s C1 have been met with lively debate. The Men’s 200m K2 is the fastest race enjoyed by spectators and whilst there is strong support for equality the level of performance in Women’s C1 is under scrutiny. Major competitions often take place on purpose made courses. These are usually 2000m long rectangular lakes built for both sprint canoeing and rowing. Courses can also be set up on naturally occurring lakes with the right physical attributes. One issue with many stretches of water big enough to accommodate these races is that they are quite open and tend to be exposed to wind. The ideal course is calm and very flat but many courses will be quite rough in inclement weather. The aim is for courses to be able to accommodate 9 boats racing side by side in marked out lanes at least 9m wide. The water should be at least 2m deep across the whole course. With the addition of warm up lanes and allowance for sides sloping down into full depth water the courses are typically more than 100m in width. Compromises are made at less major domestic racing venues where two or three lanes in the local river are enough to get some local beginner racing started. Included within the rules for sprint racing are design parameters within which all boats must fall in order to compete. There are maximum lengths and minimum weights for K1s, K2s, K4s, C1s, C2s and C4s. Canoes are not allowed to have a rudder whilst kayaks are. These lengths and weights are checked at international and some domestic competitions. Manufacturers design boats within these rules such that most boats end up looking very similar to an untrained eye. 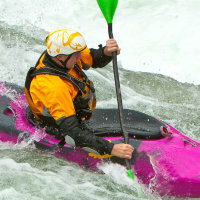 Read more about Racing Kayaks here. The best way to try sprint racing is to find a club that is involved. 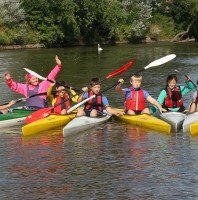 They are likely to have boats that you can try and /or will be able to help you find suitable first races to have a go at. If you’ve not paddled racing kayaks before you will want to spend some time getting used to them. There is a good deal of technique involved in paddling them well and brute force is not necessarily the best way to go fast! Most paddlers in most countries with a strong domestic sprint racing program are members of a club and it is through them that they become involved. To find out about sprint racing in your country try following the links we have on our Clubs page which will take you to home nation listings of clubs. If you are in the UK take a look at our page about sprint racing in the UK. As with any Sport there are a full set of rules for Canoe Sprint which can be viewed here. This link will take you to a very interesting results archive something to aspire to! 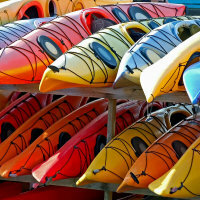 Try our downloadable list of racing kayaks from all the major brands. Watch team selection at the April Regatta & Senior National Championships. Learn more about them here. Read this to get yourself ready for your first race day. Be sure to arrive with everything you need. Read this Information before race day and make a note of what you need to remember for a stress free first race day. Find details of Local Sprint Racing in the UK.